I asked my friend Beth to share how she has grown her Facebook page. I have been impressed with how she has grown her Facebook page organically, without contests and giveaways. Her authenticity is evidenced by the level of engagement on her page. I checked her stats before publishing today. Beth has 1555 likes for her page Aunt B’s Kitchen, but more importantly, she has 1027 people talking about her page. That is an amazing level of engagement! Beth isn’t just growing a Facebook page, she is growing a community. I do know that I spend a lot of time on-line. Between writing, photographing, and promoting my blogs (there are four of them), and the time I spend interacting with readers on my Facebook page, I invest an average of 40 to 60 hours each week. All this on-line activity is really a full-time job, and I’m very fortunate that my employer allows me to work on it during quiet times at my office. Even with that overlap, much of my “leisure” time is given to this project. Focus on happiness. Share things that make you smile. No one wants to listen to a Whiny Willie or a Critical Clara. It should go without saying but, if a behavior annoys you on your page, it will annoy someone else if you do it on their page. 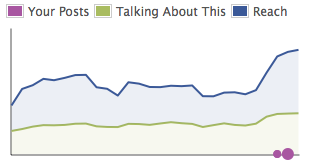 Facebook is all about interaction. Your readers want to hear your authentic voice and to know what interests you. Share links, pictures, and posts you enjoy. Reply to comments made on your page. Comment often on posts and blogs made by other pages. Facebook weights your posts in part upon their frequency and upon the frequency with which you “like” and comment on other posts. If you are going to absent yourself throughout the day, consider setting up timed posts, either through Facebook or through an application like Hoot Suite. Even with timed posts, you should set aside some time both morning and evening to respond to comments, to visit other pages, and to scan through your activity log. People will remember your kindness long after they’ve forgotten any posts you may have made. Encourage people who are just starting out. Be generous in sharing links from other pages, and be generous with your praise for their work when doing so. Listen with care to what people are saying. If they’re sharing a success or a family celebration, congratulate them. If they’re in a difficult situation, let them know that you’re sending positive thoughts their way. No amount of asking or reminding will make people join the conversation on your page. It takes time for people to find you, but they will. If you’re having fun and enjoying your interaction with your Facebook readers, people will sense it and want to join in too. More than any other thing, enjoying the process will help to grow your page. Beth’s family jokes that she started writing because she just doesn’t know when to be quiet! In truth, her blogs grew out of a long illness and helped her to keep in touch with the world around her. Beth believes the world to be a fascinating place, providing us countless gifts and wonderful surprises every single day. She’s interested in everything, and shares her interests at Aunt B on a Budget, A Word from Aunt B, B on Balance, and B-Attitude.